Looking to Protect Your Premises with an Intruder Alarm System in Hemel Hempstead? 1st Choice Security Systems provides expert advice, practical experience, and professional installation. Hemel Hempstead is one of the resounding successes of the ‘new town’ development scheme which was founded in the decade following World War Two and continues to the present day. The aim of this innovative scheme has always been to provide the architectural design, and commercial infrastructure which will build a strong community, rather than merely providing a place for people to live and work. Situated just 24 miles north of London, Hemel Hempstead has proved a popular location for commuters and young families, and its bustling 21st century town century stands testament to the vision of its architects back in the 1950s. The latest chapter in Hemel Hempstead’s success story has the technology boom at its base with numerous IT and telecommunications start-ups taking advantage of the location and the motorway network which serves the town. This, in its turn, has brought employment and wealth into the town and the last two decades have seen a dramatic increase in restaurants, hotels, conference facilities and entertainment providers. Residents will tell you that crime has also gone up they may be right as 1st Choice Security Systems has been a regular visitor to clients wanting advice on security systems for the commercial and business sectors. We will always start work with our clients by listening to their concerns, and getting a clear understanding of their business. Our security advisors will consider the specific requirements of each client, taking into account the location, access points, and staff access needs, in order to provide a bespoke security framework. 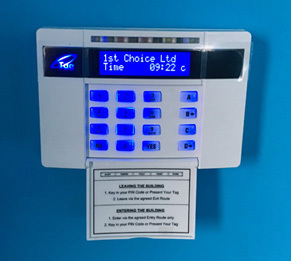 In most cases an intruder alarm system in Hemel Hempstead is likely to provide the best deterrent against criminals looking to gain entry to business premises; the provision of a professionally installed intruder alarm is also a requirement made by the vast majority of insurance companies. The business we advise on installing an intruder alarm system in Hemel Hempstead have often been referred by satisfied customers in the commercial or business sectors. When protecting your premises we would normally recommend a monitored intruder alarm system; once activated an 24 hour Alarm Receiving Centre is alerted, which then contacts a designated receiver (who may be the owner of the business, or the local police force) for an immediate response. As professional installers of commercial security systems in Hemel Hempstead, we can provide our customers with a Unique Registration Number which is needed to access police monitoring services. Having acquired peace of mind thanks to the professional installation of an intruder alarm system in Hemel Hempstead, we would advise regular maintenance of the system to ensure ongoing protection of your premises. If your premises has a legacy security system, contact 1st Choice Security Systems for a detailed service and maintenance check. Then you can enjoy that weekend break you’ve been promising yourself, knowing your business is in safe hands!